You're not imagining it. Life in college is worlds away from high school. Classes are tougher. Distractions are everywhere. For most students, this is the first time you are figuring out how to get everything done - with a whole lot less structure imposed on you. The freedom is great...but it can come at a cost when you don't have the experience and know-how to manage all those demands in your life. Procrastinate much? Pomodoro is a method designed to help you plan and track the amount of time you spend on individual tasks or chunks of bigger projects. Put a series of to-do's into the app and it will help you move along and stay on task. It's simple and very effective! Can't resist interwebs wormholes? Take the nuclear option and use the Self Control app to block out those distracting temptations for however long you need to get that paper done. iHomework 2 helps you track your assignments - keep track of grades - and keep you uber-organized in a single app. 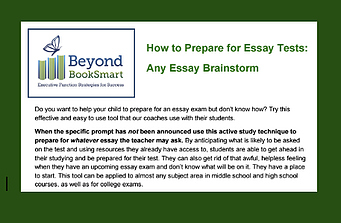 Seriously - this step by step guide to essay test prep is a proven game-changer. 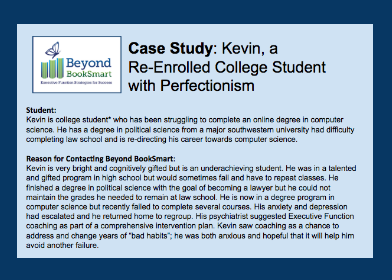 See how coaching helped Kevin be more productive and let go of his need to pass in perfect work.